I’m going to try and catch up and prepare reviews for all programs, which have joined DavidNews.com monitor in the last few weeks. 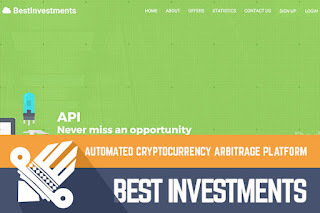 Let’s begin in the chronological order and look at the HYIP called Best Investments, which has joined Sticky Listing on our monitor on the 4th of November 2017. In total, this program has been online for 16 days. Now I have reinvested in this program $360. Keep reading to find out more about Best Investments! Let’s check out the main information about investment plans before we go into legend and some technical details of this program. In fact, there is only one investment plan. This HYIP doesn’t have any special names. It states just “12% daily for 10 calendar days” on the homepage. However, we need to consider that initial deposit is included in the payments. Therefore, we get 2% daily rate for 10 days, which is total revenue of 20% at the end of the 10-day investment term. Keep reading in case these figures seemed reasonable enough to grab your attention. According to the company biography page, Best Investments is dealing with cryptocurrency arbitrage. Basically, automated software is buying and selling cryptocurrency to make a profit. In case you have opened “About us” page you might see company registration certificate (certification of formation) assigned for Moura Mining LLC. Tried to google for it but couldn’t find any results related to this company name. According to the text below the title “Our history,” their business has started on 2016. I have read many HYIP legends and this seemed a very generic biography. Of course, don’t ever take legends too serious because in most cases we can’t check if they are real. So, Best Investments position themselves as cryptocurrency traders like most of the latest HYIP’s. The website is built using a licensed Gold Coders script. Best Investments has a simple website, which serves a general purpose – provide information. Admin has purchased a version of the SSL certificate from Comodo. There are an online chat option and other major information. However, I couldn’t find a deposit calculator, which has become a standard and can be found on most of the HYIP websites. In fact, answers to FAQ and poor information about the investment plans might be the cause of irritation for some people. Why? I couldn’t find any information about the initial deposit on the website. On the first page we see 12% a day, but no information about the initial deposit. Later we realize that 12 % include the initial deposit, which is an acceptable type of investment plans in case we were informed about it before the investment. Always search for information about the initial deposit because it will help you to understand the real interest rates. 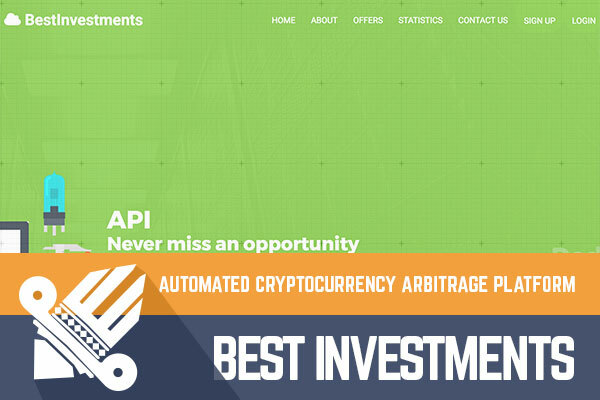 The minimum deposit in Best Investments is $5 and maximum $250 000. According to the answer on the FAQ page withdrawal requests are processed within 24 hours. Please let us know in the chat box in in case you experienced withdrawal process, which took more time than 24 hours. I already mentioned that initial deposit is included in the payments. Therefore, real profit 2% a day for 10 days. For example, $200 deposit requires 9 days to reach the breakeven point and on the last day, it would generate the profit. Such deposit would make a profit of $40 at the end of the term. The Best Investments look like a standard HYIP with standard rates. It has been online for 16 days and there must be some investors, who have already finished the 1st investment cycle. Please drop a message if you are among those. Overall impression of this HYIP is – quick approach in web design, social media marketing activities (many followers within two weeks) and lack of some standard information/features such as investment calculator, facts about the initial deposit. Of course, this program like any other has 50/50 opportunity to survive another cycle or collapse within a few days. It depends only on the admin. Therefore, if you ever decide to make any investments, don’t invest more than you can afford to lose! Have you already invested in Best Investments and have finished the full investment cycle? Please drop a message in the chat box! Investment plans: 12% daily for 10 calendar days, initial deposit included in the payments.